Wyland's passion for marine life and aquatically-inspired artwork is evident in everything he creates. "Dawn of Creation" is a limited edition lithograph on paper, numbered and hand signed by Wyland! "Dawn and Creation" is a colorful limited edition lithograph on acid free archival paper by Wyland and Steven Power. This work has bright colors that pop out in a realistic setting. A fine artwork that will enhance any fine art wall. Never unwrapped, this is a new Limited Edition signed and numbered (376/950) lithograph of Ocean Calling. Comes with certificate of authenticity. Measures 16 by 23.75”. robert wyland sculpture Crystal Glass Sea Turtle Etched Etched Signed And Numbered 740. 4” x 3” x 3/4” Shipped with USPS Priority Mail. He was a student of the Center for Creative Studies in Detroit and majored in sculpture and painting. After graduating, Professors Jay Holland, Russel Keeter and Bill Gerard urged Wyland to relocate to California where he could continue to improve on his already evident artistic talent. Wyland's boundless love of nature is clearly conveyed in each of his works with exacting detail. "A Sea of Life" is a limited edition lithograph on paper, numbered and hand signed by Wyland! Includes Certificate of Authenticity! Signed limited edition lithograph on paper by Robert Wyland. The paper has the DISNEY GALLERY IMAGES impression as shown. This is the original edition from 1994 (a smaller secondary edition was done recently). "Whale Rides" is a limited edition lithograph on paper, numbered and hand signed by both Wyland and Jim Warren! Includes Certificate of Authenticity! 18" x 26" (with border), 16.5" x 22.5" (image). Wyland's passion for marine life and aquatically-inspired artwork is evident in everything he creates. "Sounding Seas" is a limited edition lithograph on paper, numbered and hand signed by Wyland! Includes Certificate of Authenticity! NEW ROBERT WYLAND. Certificate of Authenticity From Wyland galleries Included. THIS IS A RARE MUSEUM COPY. NUMBER 23 OF 65. NOT REGULAR EDITION 1 OF 650. "HARP SEALS". Hand signed and numberedmuseum copy limited edition lithograph. Includes Certificate of Authenticity. 26.5" x 19.5" (border), 25" x 19" (image). Wyland's passion for marine life and aquatically-inspired artwork is evident in everything he creates. "Sea Turtle Reef" is a limited edition lithograph on paper, numbered and hand signed by Wyland! FOR SALE: " ISLAND PARADISE " BY ROBERT WYLAND AND A. HOGUE IS A. A COLLABORATION BETWEEN WYLAND AND HOGUE. THIS PRINT. 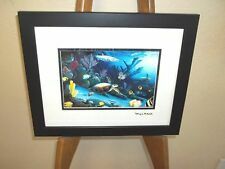 IS HAND SIGNED AND NUMBERED BY ARTIST ROBERT WYLAND. CERTIFICATE OF AUTHENTICITY FROM WYLAND GALLERIES. A wonderful black and white Chinese brushstroke style print of kissing dolphins numbered and pencil signed by renowned marine life artist Robert Wyland. No fading or wrinkles. A great addition to your collection! "Sea Otters" is a limited edition lithograph on paper, numbered and hand signed by Wyland! Includes Certificate of Authenticity! A Must Have. Ready To Hang. Sea Otters. Ready To Hang. Outside: 17" X 17". "Warmth of the Sea" is a limited edition giclee on canvas, numbered and hand signed by Wyland! Includes Certificate of Authenticity! 26" x 26" (image). He was a student of the Center for Creative Studies in Detroit and majored in sculpture and painting. Wyland's boundless love of nature is clearly conveyed in each of his works with exacting detail. “A Sea of Life” is a limited edition lithograph on paper, numbered 713/750 and hand signed by Wyland! THIS IS A HAND SIGNED LE LITHOGRAPH ON ACID FREE PAPER. IF YOU LIKE FISH, BUY THIS PRINT. IF YOU DON'T LIKE FISH, BUT MAMMALS THIS IS A WHALE OF A DEAL. Wyland's boundless love of nature is clearly conveyed in each of his works with exacting detail. "Ocean Calling" is a limited edition giclee on canvas, numbered 129/750 and hand signed by Wyland! Includes Certificate of Authenticity! "Sunset Romance" is a limited edition giclee on canvas, numbered and hand signed by Wyland! Includes Certificate of Authenticity! 32.5" x 24.5" (image). Item Details. Wyland currently lives on Oahu, in Hawaii. They wisely encouraged him to pursue animation background painting. "Northern Waters" is a sold out limited edition embossed lithograph on art paper. Robert Wyland. "Grey Whales, Mother and Calf with Orca 1983". • Lithograph. • Limited Edition Print. Size : 23 x 32 in | 58 x 81 cm. Condition : Excellent. Perfect condition. This piece is a WC(Wyland Collection). It is one of only 200 made in this proof. See pic for estimated value. Worth $7610. Feel free to make a reasonable offer. Thx! WYLAND ! - "Harp Seals - Newborn" POSTER 24" X 20"
GORGEOUS WYLAND SEALIFE AND BEACH PAINTING. He was a student of the Center for Creative Studies in Detroit and majored in sculpture and painting. After graduating, Professors Jay Holland, Russel Keeter and Bill Gerard urged Wyland to relocate to California where he could continue to improve on his already evident artistic talent. Bottom Is Black. (Reef Fish). 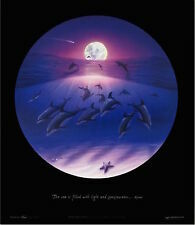 "Moonlight Celebration" is a limited edition giclee on canvas, numbered #179/750 and hand signed by Wyland! Includes Certificate of Authenticity! 20" x 20" (image). He was a student of the Center for Creative Studies in Detroit and majored in sculpture and painting. Wyland's passion for marine life and aquatically-inspired artwork is evident in everything he creates. "Sounding Seas" is a limited edition lithograph on paper, numbered 451/750 and hand signed by Wyland! Includes certificate of authenticity from the Wyland Gallery! He was a student of the Center for Creative Studies in Detroit and majored in sculpture and painting. After graduating, Professors Jay Holland, Russel Keeter and Bill Gerard urged Wyland to relocate to California where he could continue to improve on his already evident artistic talent. Top Mat Is White With Turtle Cut Out. Turtle: 2 1/2" X 2 1/2". ~READY TO HANG ~. VERY COOL ! Up for your consideration is a Wyland Dolphin Rides Limited Edition Lithograph Children Prints 1992. Silver foil. See last picture. There is an imperfection. Only noticeable when view from the side in the light. "Aumakua and the Ancient Voyagers" is a limited edition lithograph on paper, numbered 578/950 and hand signed by Wyland! He was a student of the Center for Creative Studies in Detroit and majored in sculpture and painting. Wyland's passion for marine life and aquatically-inspired artwork is evident in everything he creates. “Sea Turtle Reef ” is alimited edition lithograph on paper,numbered and hand signed by Wyland ! He attended the Center for Creative Studies in Detroit majoring in painting and sculpture. Wyland who paints in watercolors and oils celebrates underwater sea life in his paintings and bronze sculptures.